by William Bridges, Susan Bridges. Da Capo Books, 2017. Transitioning between the old and the new affects all congregations, and they feel it most profoundly when clergy leadership changes. 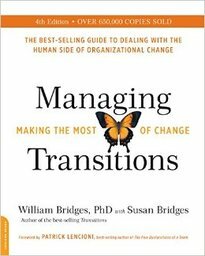 Organizational consultant and author William Bridges says that “Change is situational,” and “Transition is a three-phase process [Endings, Neutral Zone and New Beginnings], that people go through as they internalize and come to terms with . . . the new situation.” Intentionally moving through the transition as changes occur within organizational life is crucial to making effective, lasting, and healthy changes. This updated edition addresses the globally-connected and fast-paced nature of today’s business environment. The book offers insights and practical steps for managing organizational and personal change and transition. Quotes for reflection are sprinkled throughout. The five appendices include “assessing your transition readiness” and “setting up a transition monitoring team.” Bridges uses secular, business-based examples, but faith leaders can readily apply his insights to congregational life.